There are limits to the dimensions and tolerances that can be machined along the plane of the metal sheet, since etchants used in the photochemical machining process concurrently etch metals laterally and vertically through the thickness (T) of the sheet. These limitations must be taken into consideration when designing your RF Shielding or any other part that is to be photochemically machined. Because the metal at the surface of a sheet is exposed to etchant longer than the metal at the center of the sheet, the surface of a part etches laterally more than metal at the center. The following planar dimensions are related directly to the thickness of that sheet. The smallest hole diameter (D) or slot width that can be produced by the Fotofab process, as a general rule, is 1 times the metal thickness. The minimum practical diameter or slot width that can be machined is .004 inch ( 0.102 mm). Spacing of metal between the holes and/or slots in a design is not an issue using photochemical machining. 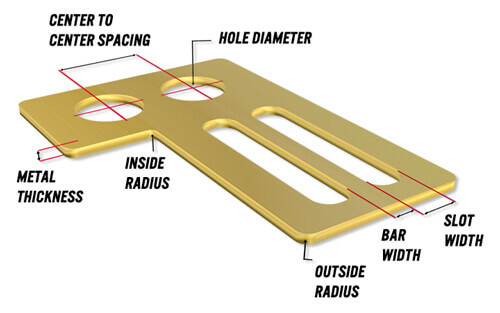 However, when a part contains holes and/or slots that are spaced closely together, such as with a fine resolution screen or encoder disc, the width of the metal that remains between them is referred to as the bar width (W). With metals over .003 inch (0.13 mm) thick, minimum bar widths must generally be at least 0.9 times the metal thickness. With metals at or under .003 inch (0.13 mm) thick, the minimum practical bar width that can be machined is .003 inch (0.076mm). In the photochemical machining process, all corners in a part, whether within or along an outside edge, will have an associated radius. The examples of various part corners and angles illustrate how we can compensate for some radii, and will help you determine whether these compensations are appropriate for your design. The diagram below illustrates various corners that are basic to many part designs. Using the photochemical machining process, the smallest inside radius (R) we recommend for a part design is approximately equivalent to the metal thickness. The smallest outside radius (r) we recommend is approximately equivalent to 0.9 times the metal thickness. For most applications, basic inside and outside corner radii are suitable. If your design requires a sharp-cornered object to fit into a photochemically machined square hole, for example, we can compensate for radii by incorporating corner reliefs as shown here. The Fotofab Process is well suited for making parts with narrow leads. The following figure illustrates the radii that will result at the base and end of the lead. If the base area of this lead needs to fit flush against another flat surface, we can compensate for the basic radii by providing the base of the lead with “relief radii” on either side.